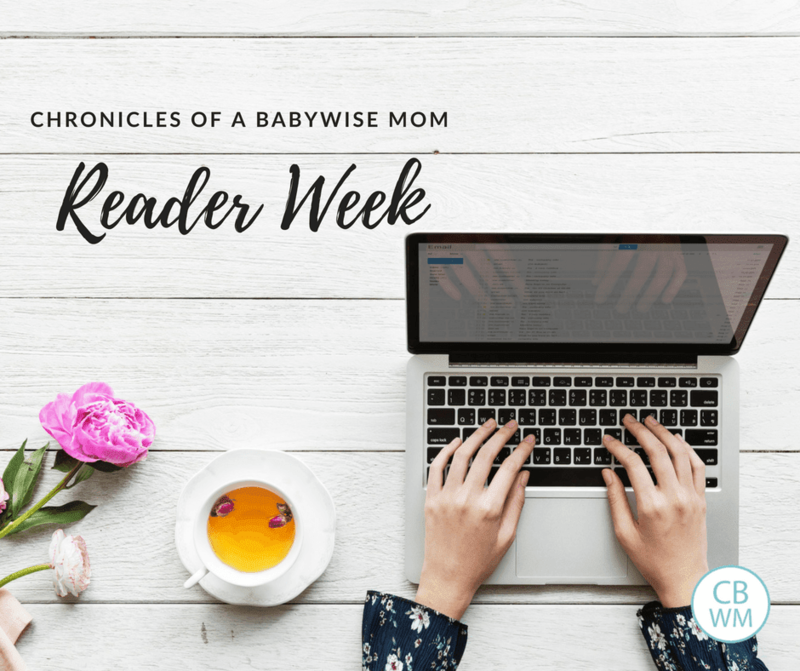 Chronicles of a Babywise Mom Reader Week 2018. Connect with other Babywise Moms. July is a different month here on the blog. We do a big BFBN week, a success story week, and a reader week. What is a reader week you may ask? Well, you are in it. It has arrived. This is my eighth year doing a reader week in July on this blog. This is the week we focus on the readers of the blog. I love to help readers connect and to help each other out. This is a week when you all get to contribute to making this blog a valuable resource. every parenting issue that can come up and I consistently learn new things from readers. For example, I never knew about a tongue tie until a reader told me about it. There is great value to working together and collaborating. That is why I continue to host this week year after year. I so appreciate you readers and all you do to contribute to this blog! Even your questions you ask me contribute because it helps me know what your common concerns are and what information will be most helpful to you. The Readers Sample Schedules posts are some of the most popular and most-visited posts on this blog. I know you love them! So be sure to drop by Tuesday and add your most recent (or any from past years!) schedules. I will have a post up linking you to all of the reader sample schedule posts so you can easily get to your pertinent sample schedule post. I would love it if you would at least pop on and share your current schedule as it is today. This will be new this year. I thought it would be fun to share some Babywise parenting hacks. Things you have done to make accomplishing your Babywise goals. Maybe you have some great tips for traveling with a baby or for juggling naps and school drop offs. Maybe you found a great cure for early waking or have a favorite sleep aid. 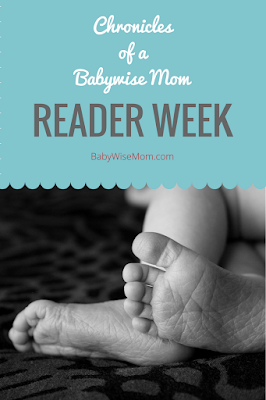 Be brainstorming your Babywise hacks for Wednesday. If you are a serious blogger, stay tuned that day for a special announcement from the Babywise Friendly Blog Network. I will put up a post Friday to link you posts where you can comment and share your favorite things. These will include baby products, toys, books, and more. These are super helpful for gift ideas (for friends and for your own children!). This is really nice as we are rounding the corner and approaching Christmas. This week as you want to share and contribute to each day, there are several ways you can do it. eMail me. Did you hear that I have a mailing list? When you sign up, you get a free printable outlining how much sleep children need from baby on up. One sheet for all of your children. You can sign up and then email me your contributions for any of the days you would like to. Facebook. Don’t forget to like and follow me on Facebook. I keep you updated with the blog posts here, share other articles that are of interest to you readers, and also interact with you about your questions. You can comment on the posts there. Facebook Group. The Facebook Group is new this year. I have been loving this group and I know the members have, also. You can share your thoughts about each day in that group. Join here. Be sure to answer the questions! I don’t admit people who do not answer. Another great way to connect is in Instagram. I share pictures from our daily lives and share quick tips that are helpful but don’t really add up to a full blog post. You can DM me or comment on my daily posts. And of course Pinterest is another fun way to connect. I pin things helpful to a parent in all ways, from specific parenting helps to fun activities, travel ideas, school helps, and dinner ideas (and more!). It isn’t really the most efficient way to communicate back and forth, but it is there if you need it. If you are a tweeter, follow me on Twitter to get little updates on what is going on the blog. You can tweet comments to me there if you don’t use the other methods of social media above. Hello! I am a long time reader and have been implementing babywise for my daughters (6, and almost 3) since birth. my question right now is for my very active and energetic almost three-year-old. Her bedtime sleep habits have been progressively declining since November of last year when we took away her paci. shortly after that she began climbing out of her crib (she was 27 months at the time) so we transitioned into a big bed for her safety. Before this, bedtime was fairly easy. it has been taking her progressively longer to fall asleep at night since and currently doesnt fall asleep until closer to 10pm every night after wakeup times between 6-7:30am. Naps (between 12:30-1pm) have always been very easy for her and she will fall asleep within two minutes for about two hours. However, at bedtime (we've now tried over the course of months anywhere between 6:30-8:30p), she can scream for hours. If we shut her door, she has destroyed most of the items in her room (this is a huge safety concern). If we leave the door cracked, she will come out over and over. While being as consistent as we can with her daily routine and bedtime, she will never go to sleep quickly or without a fight at night. We have also tried tweaking the timing and length of her nap and that has not helped. Lately, as a last resort due to her age (three next month), I have been experimenting with taking away her nap all together. I suspect she is a lower-sleep needs kid, so i had hopes this would help. However, it is a full-time job making sure she does not fall asleep during the day and often will in the car. If she even sleeps for 5 minutes, she is rejuvenated and will still take until 10-10:30 to fall asleep. Lack of nap truly does not seem to help her nighttime sleep. She is a very active toddler during the day regardless.Needless to say, we are out of ideas to try with her. She is currently sleeping less than anyone else in the house including me and my husband some nights. I am due with baby #3 in november and will then be sharing a room with big sister. I have been trying to solve this sleep issue for 8 months and need to resolve this so i have energy for a newborn. Any help is so greatly appreciated!